Not to be confused with Hardin, Texas. Hardin County is a county located in the U.S. state of Texas, United States. As of the 2010 census, its population was 54,635. The county seat is Kountze. The county is named for the family of William Hardin from Liberty County, Texas. Hardin County is part of the Beaumont-Port Arthur, TX Metropolitan Statistical Area. The current Hardin County Courthouse was built in 1959. It is at least the third courthouse to serve Hardin County. According to the U.S. Census Bureau, the county has a total area of 898 square miles (2,330 km2), of which 891 square miles (2,310 km2) are land and 7.0 square miles (18 km2) (0.8%) are covered by water. 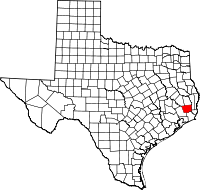 Hardin County is located on the flat coastal plains of Southeast Texas, roughly 30 mi (48 km) north of the Gulf of Mexico. The county is largely covered by the dense forest of the Big Thicket. It is crossed by numerous small streams and creeks which drain the county into the Neches River, which forms the eastern boundary of the county. As of the 2010 census, Hardin County had a population of 54,635. The ethnic and racial composition of the population was 88.0% non-Hispanic white, 5.8% African American, 0.4% Native American, 0.5% Asian, 1.3% from some other race, and 1.3% from two or more races. As of the census of 2000, 48,073 people, 17,805 households, and 13,638 families resided in the county. The population density was 54 people per square mile (21/km²). The 19,836 housing units averaged 22 per square mile (9/km²). The racial makeup of the county was 90.86% White, 6.91% Black or African American, 0.32% Native American, 0.23% Asian, 0.01% Pacific Islander, 0.74% from other races, and 0.93% from two or more races. About 2.54% of the population were Hispanic or Latino of any race. Of the 17,805 households, 37.2% had children under the age of 18 living with them, 62.6% were married couples living together, 10.2% had a female householder with no husband present, and 23.4% were not families; 20.7% of all households were made up of individuals, and 9.2% had someone living alone who was 65 years of age or older. The average household size was 2.68 and the average family size was 3.09. In the county, the population was distributed as 27.8% under the age of 18, 8.5% from 18 to 24, 28.3% from 25 to 44, 23.2% from 45 to 64, and 12.2% who were 65 years of age or older. The median age was 36 years. For every 100 females, there were 96.7 males. For every 100 females age 18 and over, there were 92.4 males. The median income for a household in the county was $37,612, and for a family was $42,890. Males had a median income of $35,881 versus $22,823 for females. The per capita income for the county was $17,962. About 8.8% of families and 11.20% of the population were below the poverty line, including 13.3% of those under age 18 and 10.6% of those age 65 or over. ^ Duncan, Patricia L. "Hardin County". Texas State Historical Association. Retrieved 12 April 2014.